If you often travel for work or leisure and don’t have an offline navigation app on your mobile phone, you are not doing it right. When you are traveling to a foreign country, you are charged a lot of money. Instead, you can download the map when you are at home and save them for later use. The offline GPS location app loads faster than an online app, which means there are no buffering and delays so you won’t lose a turn. Even though the GPS navigation app, you get live traffic updates, which is an incredible feature offered by any offline GPS app. 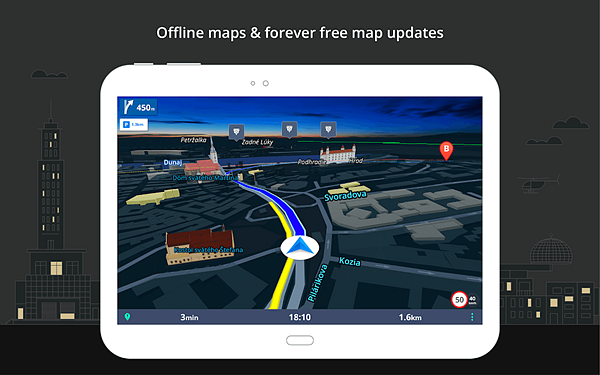 The best offline GPS app for Android you can ever find, Offline Maps & Navigation has offline maps of all countries from around the world. The maps are optimized in such a such that they take up very little space on your mobile phone. Offline Maps & Navigation is updated several times a year so that all recent road developments and new train and metro lines are up to date. It also offers voice-guided GPS navigation and real-time route sharing, so you can share your arrival time and time left to reach the destination with friends and family for safety. 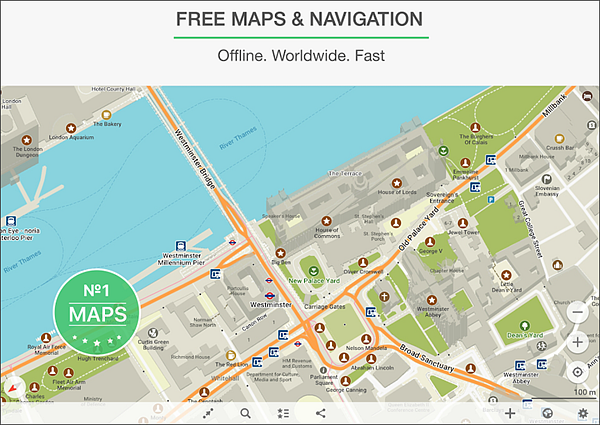 With over 100 million downloads worldwide, MAPS.ME is a free GPS app for Android without internet that offers driving, walking, and cycle navigation. The app has excellent detailing and has all information about hiking trails, points of interest, and restaurants and hotels that aren’t usually available on other offline maps. You can save locations individually and share them with friends and family. You can customize the search depending on what you want including public transport, tourist attractions, ATMs, and hotels. 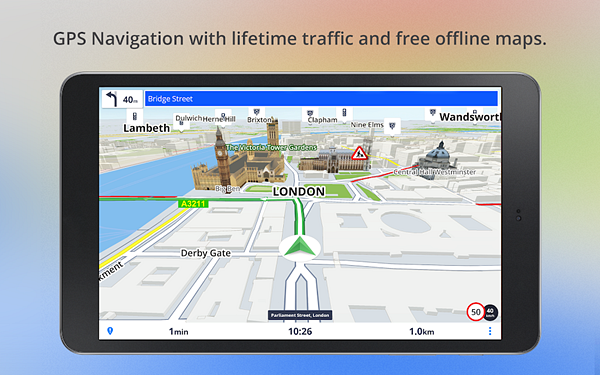 One of the best offline navigation app for Android, Google Maps is reliable and trustworthy. More than one billion people use it daily because it offers offline maps of 220 countries. It can be used online as well. 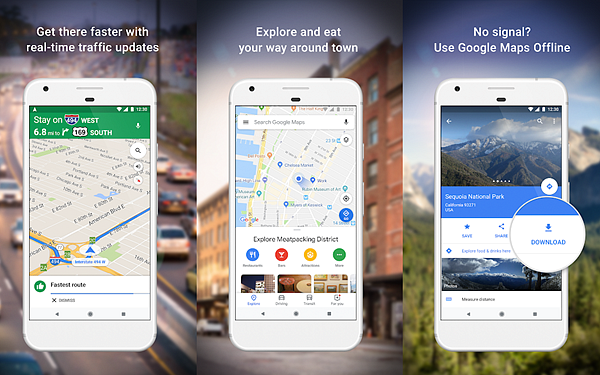 Google Maps offers accurate real-time ETAs, automatic rerouting based on road closures, live traffic, and accidents, and local-like experience. You can use the offline Google Maps to check indoor imagery for museums, shops, and restaurants along with the virtual street view. You also get indoor maps of all international airports and a good number of domestic airports so that you can navigate your way through comfortably. The app also allows you to create a map of your favorite places to visit, which saves time when you are travelling. 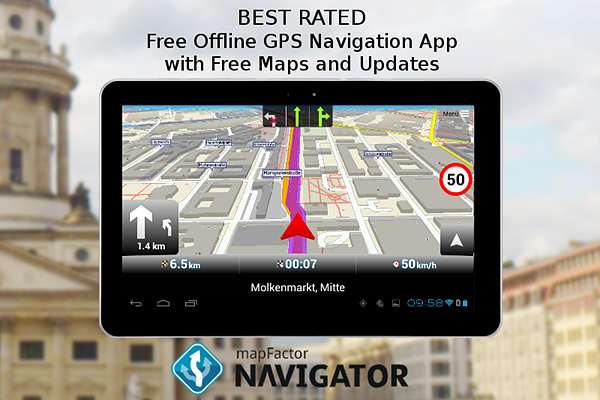 MapFactor GPS Navigation is an offline map with GPS offered by OpenStreetMaps that has more than 30 million downloads. Key features of the app include information about points of interest, door-to-door route planning, voice recognition in commonly spoken languages, camera warnings, data on speed limits, day and night map modes, routing modes for the cycle, pedestrian, car, bus, train, and trucks, and driving directions. You can customize the app the way you want for absolutely free. If you want more features, go in for the premium version. It offers professional TomTom maps, head-up displays, no pop-up ads, information on alternative routes, and live HD Traffic information. Whether you are taking public transport or riding your way through a new city on a cycle, HERE WeGo – Offline Maps & GPS is the best offlinenavigation app for Android for you. It has public transit information of over 1,300 cities from around the world including New York, Toronto, Melbourne, Mumbai, Paris, Barcelona, and Madrid. The app has 22 million plus downloads and was voted as the number one by 250,000 on Google Play. 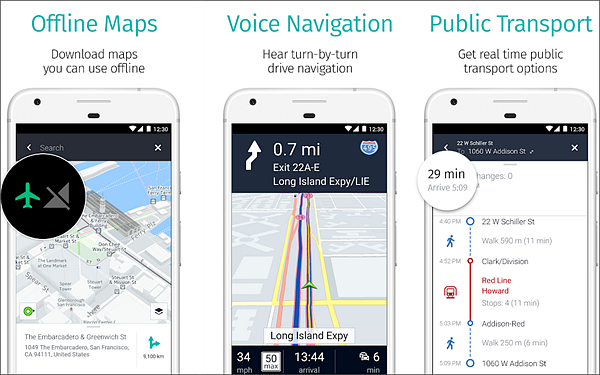 HERE WeGo – Offline Maps & GPS offers voice navigation, special bike routes, and real-time public transportation information. Compared to other offline apps, this is a relatively simpler one because it is designed to save space on your mobile phone and consumer less energy. 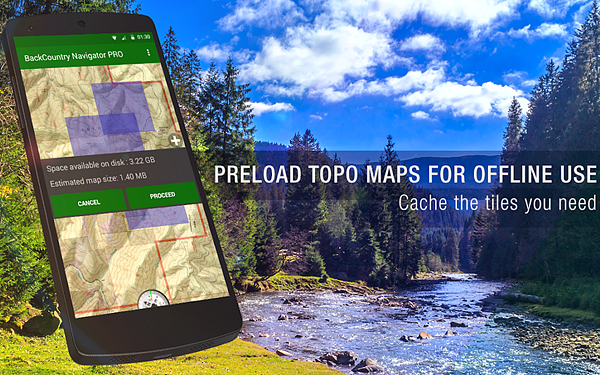 One of the latest offline Android navigation apps introduced on Google Play, BackCountry Navigator TOPO GPS PRO allows you to enter your own coordinates using grid reference, longitude/latitude, MGRS, or UTM. The maps that you download and save take very little space. The app is compatible with Android Wear, so you can navigate the town without having to take out your phone again and again. BackCountry Navigator TOPO GPS PRO is a paid app and an ideal choice for frequent travelers because it offers more than just traffic-free routes and points of interest. Unique features offered by the app include aerial photography with markup, OpenCycleMaps, Japan GSI maps, topographical maps of New Zealand, Canada, Spain, and Italy, and USGS color aerial photography. It also has fishing GPS, which no other offline app offers. With 500 million users worldwide, GPS Navigation & Offline Maps Sygic has reliable real-time traffic information. The GPS navigation offline app gives information on speed limit warnings, advanced safety features while driving in an unknown city or country, dash cam recorder to document your travels, and real-time route sharing with friends and family to make sure you are safe. It also offers data on places that offer free parking and gas stations with cleanest and lowest fuel cost along with other common features available in all offline apps. You can download the paid version for an ad-free experience. 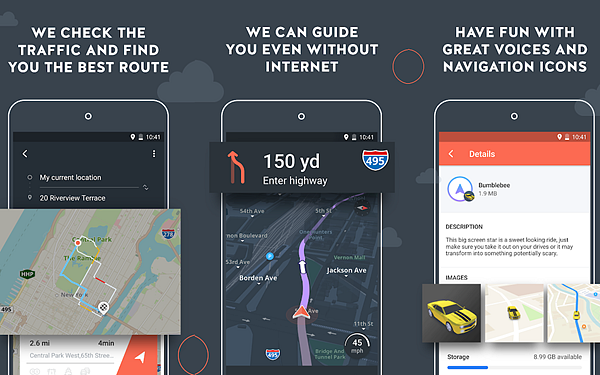 This offline navigation app in not only a navigator but also a free travel planner. One of the most useful features offers by the app is the shortest track guidance, so that you save time while planning your tour. Other excellent features include full voice guidance with spoken street names, one-box search, information on current location, offline route finder, open street maps, and real view navigation. It gives you peace of mind. Go anywhere, you don’t have to rely on internet connection. You can save the location of your car and provide special notices for transportation, school districts, accidents, etc. Always choose an app that offers voice navigation and information on traffic and road closures. They should take up the least space on your phone and don’t take a lot of time to buffer. Keeping in mind these things, we recommend you to download any of these apps — Offline Maps & Navigation, Google Maps, and HERE WeGo – Offline Maps & GPS. They have an interactive user design, offline maps of all countries, and save battery life.